I'm pretty sure I'm a Libra. Like the lady here, I'm often seen carrying scales of my own. It's quite a balancing act. Who had the bright idea of messing with my zodiac sign? Now, I’m no devout follower of astrology, but I’ve always taken it for a fact that I am a Libra. Sure, I was born on the cusp, somewhere between Virgo and Libra. But most astrology sections of newspapers and magazines have me pegged for a Libra and I believe them. Clearly, that is the sign that suits me best. Let me assure you that I have more Libra qualities in my little pinky than a genuine Virgo has in their entire body. Indeed, I take great pride in my Libra-isms! I am balanced, diplomatic and urbane, don’t you think? I am sociable, too (as long as no one bothers me in the morning or on weekends). Here’s what I’m not: modest and shy, meticulous and analytical—all traits of a Virgo. So, ergo, I’m no Virgo. And yet, suddenly I am not on the cusp but, rather, decidedly smack in the middle of Virgo territory. It’s as if someone has stolen my identity! For, according to some hapless astronomers, who shall remain nameless, I’ve been cut to the quick–snatched from the comfort of my Libra persona. Which makes me persona non grata. See if I continue to believe in what lies in the stars! My kids have been reassigned too. Sarah went from being a Pisces to an Aquarius and Josh, who used to be an Aries, is now a Pisces. Which is ironic because Sarah was the fish in our family, spending countless summers swimming in the pool and at the beach. Whereas, Josh, not so much. Well, I for one, plan to stick with the old Zodiac calendar. 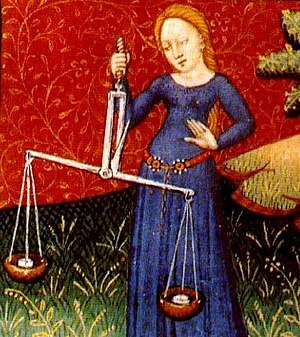 I’m too set in my ways, (though, I must say, I remain as balanced as the Libra scales), to do anything else. So I will be boycotting the new zodiac calendar (and that goes for you, Ophiuchus! ), and that means no one better call me a Virgo. And as for the astronomers who brought back the Babylonian zodiac, well, as far as I’m concerned, they’re all on notice! The Zodiac calendar update only applies to people born after 2009… Monica, you are MOST DEFINITELY a lucky, balanced (observable by your tap dancing skills) and charming Libra!!! Yeah, Zodiac and opposite attracts. Why did it upset people? I hope it was because they’re upset too about having their sign changed and not because of anything you wrote. Do tell! No, nothing that I posted, just that they’ve been studying their sign and have lived by the prophets and the stars tell all and their chakra is out of wack now and they’ll have to rearrange all their furniture…well you get my drift. Sometimes these astronomers should just keep their mouths shut! OH please…..I had a blog about this as well and deleted it because it was upsetting people. I’m a LEO. ‘nuf said. I’m not a Cancer. My husband is a true Cancer, not a Gemini. This is never going to fly. Next going to say that there’s 8 days in a week because of the massive shift the earth took when Haiti had their earthquake.